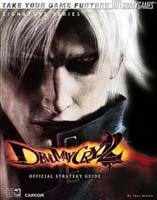 BradyGames' Devil May Cry 2 Official Strategy Guide provides secret room locations, and strategies for unlocking hidden characters, costumes, and all play modes. In addition, the detailed area maps illustrate items and weapons in each area. Mighty boss strategies will help players defeat every fiend. Complete walkthroughs for both main characters are also provided, along with tips to achieve the highest ranking for each mission. This Signature Series guide features a special cover treatment, bonus content, and a cool poster depicting the game's heroes.